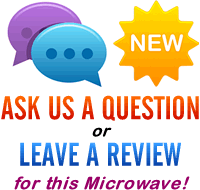 A great microwave - versatile, easy to use and reliable. Some users have experienced issues with the lighting - however the majority of users aren't affected by this issue - asides from that it's great. The first thing to point out about this combi microwave is the overall size - it isn't particularly small or light - measuring 53cm by 34.4cm by 50.8cm and weighing 21kg, it will take up a large section of your work top. At around £280, this Panasonic microwave isn't particularly suitable for those on a budget - however, you do get a lot of appliance for your money. It features three main facilities - microwave, grill and oven, as well as a large 32 litre interior that will be highly suitable for large families. The interior measures approximately 35cm by 25cm by 36cm - and as such it should be able to accommodate large dishes. In terms of design and construction, it is very well constructed, and is finished in a brushed stainless steel exterior - which has the added bonus of not showing fingerprints. The black and silver finish looks smart, and all of our test team liked the overall design. The convection oven provides a temperature range of between 100 to 250w, and cooked beautifully during the test - we tried a variety of foods and all turned out well. The 1500w grill again performed very well, both cooking and crisping food. The grill and convection settings can be used separately or together in conjunction with the regular microwave oven setting - ideal for foods which require cooking and then finishing off under the grill. The built in auto settings worked pretty well - and the comprehensive manual covers pretty much every question you're going to have if you had any difficulty operating this machine. The chaos defrost setting does exactly that - defrosts without cooking the food - we tested this on frozen meat, and it worked really well. So who is it aimed at? At the best part of £300, it is not cheap - however it does have three factors in it's favour - it's large, reliable, and cooks incredibly well. 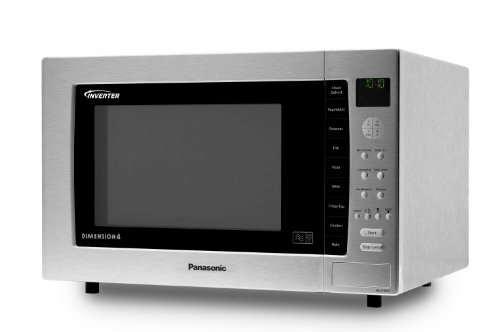 If you have a large family, or work in a commercial environment, or simply have the room and budget for a large, versatile silver microwave - one that "just works" - then we'd highly recommend the Panasonic NN-CT890S. Overall we can't recommend this microwave enough - works exceedingly well, cooks beautifully and looks great. If you can afford one, then it's well worth investing in.